downshift problems keep Jacques in the box. Some prayed for rain, some didnt, but most knew that it would make not a jot of difference to the race outcome of the San Marino Grand Prix at Imola. It was really a matter of which of the two Williams drivers would cross the line first. A wet warm up session in the morning gave the baying tifosi a glimmer of hope in seeing their beloved red cars trounce the opposition and, it nearly came to pass, opposition not being trounced, but, one might say, closely monitored as one Williams gave up the ghost and the other, taking the flag a length or so in front of second place man and local hero, Michael Schumacher. Frentzen finally got the result he needed with a fine drive. On a drying track warmed by a pastel sun behind high hazy clouds, the race got underway with an incident free start for the first time this year. The first three cars made an equally lightning getaway leaving Villeneuve in the lead, but wobbling on his brakes into the first turn fending off Schumacher who had slipped passed Heinz Harald Frentzen on the line. Olivier Panis in the Bridgestone-shod Prost Mugen Honda was caught on the grid by both Johnny Herbert in the Sauber Petronas and Ralf Schumachers Jordan Peugeot, who proceeded to attack the already widening gap between himself and the 3rd placed Williams. One driver who was probably wishing that the heavens would open and wash him away, was World Champion Damon Hill who made an inauspicious exit from the pitlane in the spare car under the guise of having his settings changed for wet weather. It was later revealed that this rather feeble excuse covered up yet another mechanical fault in the Arrows A18 and another blunder by the TWR team in the shape of a starter motor shaft oil seal failure. Hills race was run before he hit the track, but hit it he did, charging from the pit lane in futile pursuit of last man Ukyo Katayama. 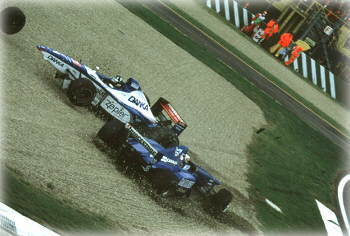 Villeneuve proceeded to open up a huge gap, reeling of a succession of fastest laps, leaving a frustrated Frentzen in the wake of the slower Ferrari and desperately seeking a way round. Schumacher Jnr was unable to match the pace of the top three but was keeping Herbert and Panis under a tight leash setting the tempo for the crocodile of cars behind. Hill's day finished early following a frustrating mechanical failure. Hills fateful day came to an untimely conclusion when, understandably frustrated by earlier events and the uncompromising nature of the circuit, he took a long dive at Shinji Nokanos Prost on the entry to the Variente Bassa complex. The inevitable collision occurred, Hill losing his front wheel and sending the talentless Japanese spinning into the dirt. "I touched him alright, in fact I T-boned him," said an uncharacteristically darkly-humoured Hill after the race, "I thought it was ambitious, yes, but I wasnt going to tag around at the back of the field. I caught him up, as I was 3 secs a lap quicker. He blocked me for a lap and to be honest, I was pretty cheesed off after starting in the pit lane. The move was only on if he let me through...but he didnt. You dont enjoy being held up by people who shouldnt be holding you up. For the first time this season, he let go at the team, "Weve got to get our act together," he said, "We have not had one race meeting yet where I have not sprung an oil leak either on the grid or in the pits." It was quite clear that Hill was getting to the end of his tether and the racing driver in him was just itching to get out. The blame for the incident could not really be laid fully at Nakanos feet. "Hill just ran into me from behind at the last chicane." Calling Hill Mr World Champion, he explained, "I saw him in my mirrors but, as I turned in, he hit the rear left of my car hard." Being realistic, the chance of a major points loss caused by this incident however, seemed slim indeed. To add to his wretched weekend, Hill was given a suspended one race ban by the stewards who had no doubts at all as to where the blame lay. His team-mate Pedro Diniz collected a similar prize for causing a near miss with Jacques Villeneuve. In addition to taking his driver out, Hill may have brought back grim memories for team boss Alain Prost who on several occasions in his own career, must have suffered the same frustrations. A series of retirements before the first round of stops changed the order of the mid runners, when Ralf Schumacher after a superb drive, retired with a broken drive shaft handing fourth place to Herbert who, coasting to a standstill with an electrical fault moments later, handed his place to Irvine. Panis by this time had dropped back down the line clearly struggling with his Bridgestone tyres, the infallibility of which up until this point, had been legendary. This could be portentous for the Japanese manufacturer and the chink in their armour that Goodyear were looking for. Nil points for Olivier this time. By the time Schumacher made his first pit stop on Lap 24, Frentzen was buzzing around his exhaust like an angry bee and, using the clear air, he put in two truly electrifying laps while his team-mate stopped for tyres also. Those vital seconds gained, combined with Villeneuves out lap being hampered by traffic, enabled him to retain his lead and he started pulling away at the rate of over a second a lap. Tables were now turned for the Williams boys and, about time. Indeed Villeneuve seemed to be having trouble hanging on to Schumacher and it looked at one point that he would be swallowed up by the McLaren of David Coulthard who, on a 1 stop strategy was light on fuel and moving very quickly. Retirement for Rubens Barrichello came with a loss of oil pressure after a solid drive in 8th and proving to be the better of the Bridgestone runners. This makes the second retirement in a row for the Stewart Ford team." We have had a troubled weekend and weve just got to see what we can do about it." commented Jackie Stewart afterwards. The gaggle of mid-placed cars were still trying to make a race of it 27 second behind the race leaders. Making things worse, was Ukyo Katayama thinking that Sundays were for driving slow and looking at the scenery and not in ones mirrors. Had he done so, he would have seen not only Coulthard bearing down on him but Irvine, Giancarlo Fisichella, desperate to prove a point to his departed and unmissed team-mate Schumacher, and Panis. A fine spray of oil was now emanating from the back of Coulthards McLaren and undoubtedly this gave Fisichella the opportunity to make a daring move past Irvines momentarily sliding Ferrari, only to have his visor splattered with oil seconds later, as the McLaren Mercedes, exploded in a billow of white smoke. It was now obvious that Villeneuve was in trouble and after a prolonged pit stop on lap 42, where a desperate attempt to fit a new steering wheel and get the jammed gearbox into neutral met without success after two full minutes, the car was wheeled into the garage, a bitterly disappointed Canadian still strapped tightly in his cockpit. "The car was strong all weekend and it is a great disappointment." Villeneuve said, "The gears wouldnt change down, but then I got on the straight, accelerated and it would change down by itself, so I lost control of the gears. Its impossible to drive like that." 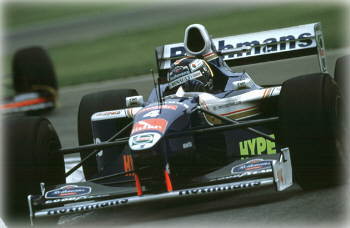 Frentzen responded to the demise of his team mate with a fastest lap, handing the lead briefly to Schumacher when he made his final pit stop. Schumacher couldnt hold onto it, being forced to brake heavily by a wayward Nicola Larini and then having to follow him into the pits, losing valuable time in the process. The position was not to change. Irvine having regained his place over Fisichella by way of a timely pitstop and inheriting Villeneuves space, found himself in third, albeit 18 seconds down with an easy cruise to the second podium finish in a row. "I had a good idea he (Fisichella) had more fuel onboard so I could go longer in the 2nd stint and I was able to overtake him in the pits." Said Irvine, clearly unfazed by the result, "After the 2nd pit stop it was quite boring, plodding along to the finish. Its nice to be back on the podium, but it didnt give me the same buzz as two weeks ago." As the rain started to spot the drivers mirrors, Heinz Harald Frentzen crossed the line to take the flag hotly pursued in the latter stages by Schumacher who followed, breathing down his neck 1.2 seconds behind. "The car was working fairly well and I was basically happy. Second is more than I expected." Said a delighted Schumacher, " We are the only team that can go at almost the speed of the Williams and certain changes in our car soon, may give us the step up we are looking for." Oddly enough the Italians got what they wanted by seeing two thirds of the podium covered in red and indeed Fans crossing the borders to see new German hero Frentzen make good, got a double Teutonic helping, it being a first in Grand Prix history. Schumacher also promised more German dominance to come and one can only surmise what will happen when younger brother Ralf, throws his towel on the top step of the podium. Frentzen of course was delighted and, initially lost for words but eventually his faltering English never sounded so eloquent, "Its very much like....oil on my soul. I put in two quick laps before my pit stop and gained about 2 seconds and when I came out and saw P1, I was absolutely pleased and surprised. I was concerned about the brakes, I didnt want to happen again what happened in Melbourne. I had to push but I didnt brake as much as I could have done. I tried to save more brakes at the end." Williams Boss, Frank Williams, allowing the Formula 1 fraternity a rare smile, was not advertising his vindication in his decision to replace Hill with the young German. He said, "He was concerned about his brakes, but they were fine and we were telling him to go quicker, but, he was in control." Fully aware of the increased pressure this will now put on him to continue his success rather than to achieve it for the first time, Frentzen stated earlier that he become the prey instead of being the hunter. But, despite his undeniably dazzling win, a shadow of doubt must still remain as to Frentzens consistent race winning capabilities. With the real yard stick having retired and his fellow countryman driving a car lacking the outright speed of the Williams, yet finishing less than a second and a half behind, the German has, for the time being at least, still to be the hunter and win, against the only man that is capable at this moment, of going faster.